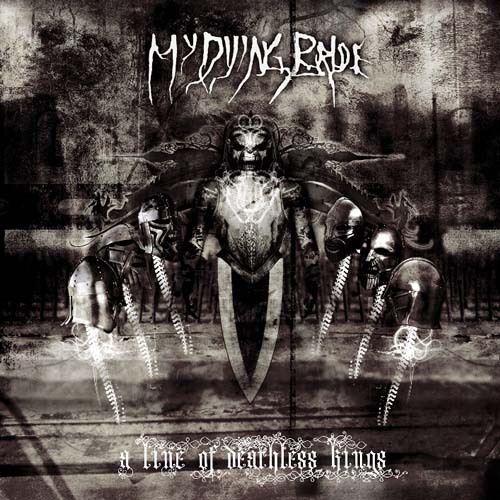 A Line of Deathless Kings is the 9th melodramatic outing by English metal outfit My Dying Bride. If the band’s name and song titles weren’t obvious enough, you can expect to hear a lot of what can only be described as funeral inspired music as interpreted by a metal band. Coupled with the morose lyrics of founding member and singer Aaron Stainthorpe, it becomes quite apparent that the members of My Dying Bride have being living in perpetual misery ever since their sand castles where kicked over one too many times during their childhood. Monolithic guitar plods are woven together with haunted but infrequent keyboard ambiance and some contrastingly speedy percussive rhythms that create an eerie yet powerful sound for A Line of Deathless Kings. The album is highly consistent and My Dying Bride only breaks character momentarily on Loves Intolerable Pain and at the end of The Blood, the Wine, the Roses to go from their usual mournful tones to delve into flashes of rage that come as quickly as they go. My Dying Bride lives up to their subgenres namesake and the poetic lyrics will be a treat for fans of the macabre but for those wanting something to smile about are better off looking elsewhere.